Contains Peppermint Supreme Oil (Mentha piperita), Rosemary, Basil , Clove Bud, Eucalyptus Globulus, Frankincense, Lavender (Lavandula angustifolia), Sweet Marjoram (Origanum majorana), Patchouli Description Headache Be Gone We may take drugs or schedule a periodic massage but throbbing headaches can remain. That distressing hurt can make even the simplest expedition into an exhaustive exercise. Headache Be Gone is combined to deliver an all-natural answer to headaches that can truly relax the muscles so you can feel your finest. With a minty and earthy aroma, Headache Be Gone is made up of intricate oils to release discomfort. By applying Headache Be Gone to your temples and forehead, you can relax and recuperate your energy. Little one’s can be imaginative when relating pain. 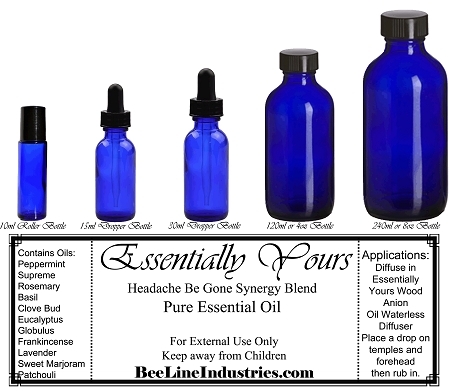 This Headache Be Gone blend sends even a monster sized headache fleeing when applied at the first indications of pain. Applications Diffuse in intervals of 5 seconds on, 30 seconds off, with the Essentially Yours Wood Anion Oil Diffuser - Waterless, in your room, or in your little one’s room and turn when in the room. Place a drop on your temples and forehead. We may take drugs or schedule a periodic massage but throbbing headaches can remain. That distressing hurt can make even the simplest expedition into an exhaustive exercise. Headache Be Gone is combined to deliver an all-natural answer to headaches that can truly relax the muscles so you can feel your finest. With a minty and earthy aroma, Headache Be Gone is made up of intricate oils to release discomfort. By applying Headache Be Gone to your temples and forehead, you can relax and recuperate your energy. Little one’s can be imaginative when relating pain. This Headache Be Gone blend sends even a monster sized headache fleeing when applied at the first indications of pain. Diffuse in intervals of 5 seconds on, 30 seconds off, with the Essentially Yours Wood Anion Oil Diffuser - Waterless, in your room, or in your little one’s room and turn when in the room. Place a drop on your temples and forehead.